Shortly before his death in October 2009, we had agreed with Russ Ackoff the text of his latest contribution to the management debate. Called Systems Thinking for Curious Managers it features more than 40 new and previously unpublished f-LAWS (in the same vein as those published in his 2007 title, Management f-LAWS). As before, each f-LAW is accompanied by a witty, sometimes acerbic and always insightful commentary. Any one of these could serve as the ideal starting point for a strategy or planning meeting, for a team discussion, for a position or briefing paper. A moving tribute to Russ Ackoff in the Foreword by his long-time friend and business partner Jamshid Gharajedaghi. 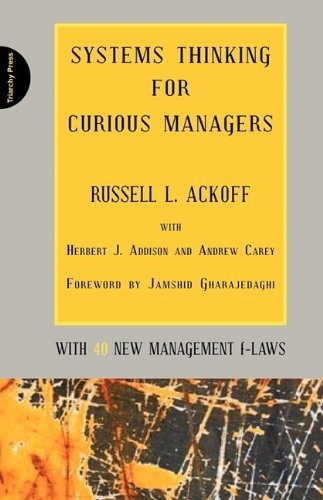 Systems Thinking for Curious Managers is a wonderful tribute to Russ Ackoff's life at the forefront of management thinking. Russell Ackoff, who died in 2009, was one of the world's leading business thinkers and one of the founding fathers of Systems Thinking. His Management f-Laws (a term coined by Ackoff) expose the conventions and laws of management the hierarchies and power struggles, the ineptitudes and time-wasting, the prejudices and careless thinking as flaws of management: all of which hinder successful strategies for organizational change and development. Anyone who works in an organisation, anywhere. Plus students and managers interested in getting to grips with Systems Thinking.